The ETI CablePod (TM) elegantly addresses every important design challenge relating to sound quality in a binding post. 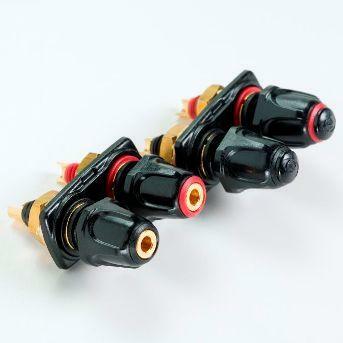 It carefully balances improved electron flow with mechanical integrity, and does so in a binding post that is compatible with all common loudspeaker cable terminations. The right base metals of high purity Tellurium Copper with direct plated 24k Gold were used. Careful attention was paid to the thickness and mass of the contact element. In subverting visual appeal to improved performance we went where few other manufacturers in our experience have gone. We devoted months of calculations based on the S/G Ratio, experimentation and machining, all with the sole and overriding purpose of creating a contact element that is ideal in size and shape to support current flow but to minimise skin effect. Rather than sandwiching the spade or bare wire between two metal surfaces, we created a unique telescoping mechanism in which a high strength polymer captures the speaker termination and presses it snugly against a single metal conducting surface. The reduced mass of metal and the unique clamping mechanism provide both better sound and a more secure connection. We removed the typical binding post securing nut from the conductive path by incorporating an over moulded polymer thread to insulate the nut from the contact element. Not until now has so much attention been given or time devoted to improving the electron flow, signal integrity, and sound quality in a binding post. The ETI CablePod? offers improvements in these areas of such significance they simply must be heard to be believed.